Had this mouthwatering dish called Thisre (or Thisro) Sukka in Goa prepared by my granny . Loved her style of cooking from years and the perfection she maintains till date. Love you Aayi for this dish. Tasted this last month and missing this now. Clams( Shell fish) in Konkani is called Thisre in Goa. The main task involved here is to clean this Clams. I always look out for short cuts and that is to wash this thoroughly with water and then boil with very little water. The shells open and then its easier to remove the fish. My granny nor my mother opt for such short cuts. They manually cut these clams into halves with the help of sharp knife. Maybe thats why the dishes prepared by them stands extremely good. For any beginners trying out this dish, I suggest my way of shortcut cleaning - boiling method. 1. Clean the clams as mentioned above. 2. Take little water in a vessel. Add these cleaned clams. You can use this clams with shells or remove and use the fish inside and throw away the shells. Consumption is only the fish inside the clams. 3. Add Haldi, Red chilli powder,freshly grated coconut and Onions to this. Cover the lid and cook for 10 mins. 4. Add salt and mix well. Cook again till water evaporates. 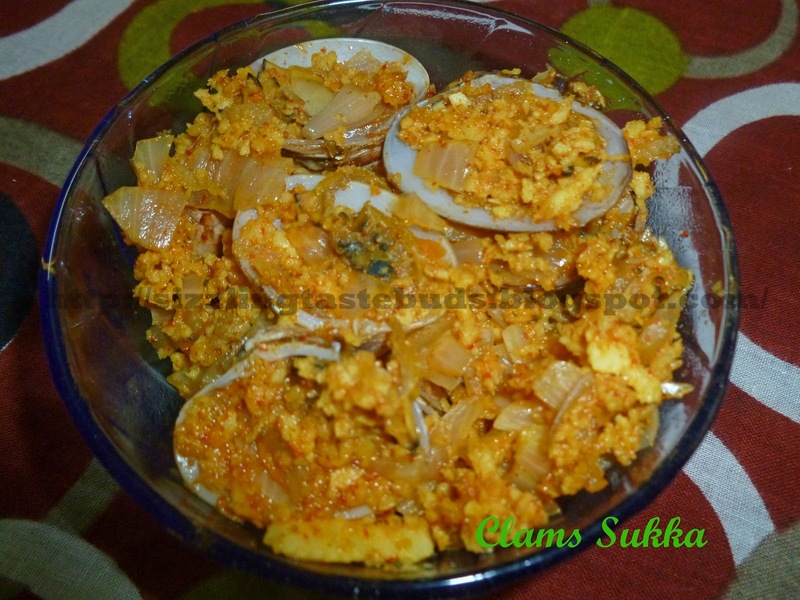 Yummy mouthwatering dish Clams Sukka ready to be served. i am confused thaat what was the stuff in back shade of gravy? is it boiled potato or egg? anyways one thing tell i am curious about the mouth watering spicey goan food..